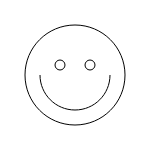 Drawing a smiley face with the 2D canvas API. This is a port of part of this MDN tutorial to web-sys. The Cargo.toml enables features necessary to query the DOM and work with 2D canvas. Gets the <canvas> element, creates a 2D rendering context, and draws the smiley face. // Draw the outer circle. // Draw the left eye. // Draw the right eye.